As motorcycle riders, I feel that most of us have a decent understanding of how an internal combustion engine works (Those of us of a certain age at least - JM). We may not all be able to rebuild one ourselves, but we do have the basics of 4 cycle operation under our belts. 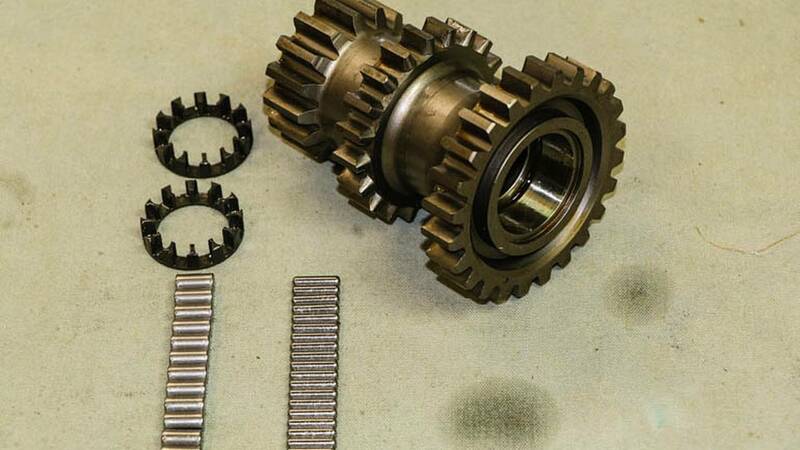 When it comes to transmissions, it seems that what is happening inside is a lot more of a mystery to the average rider. 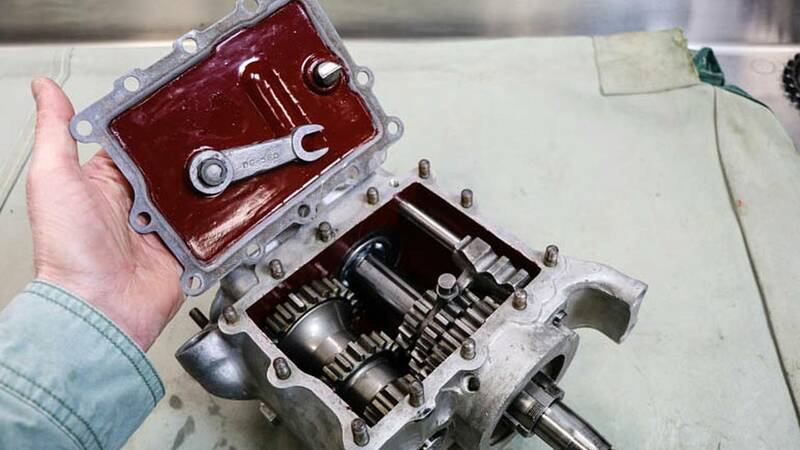 I'm currently rebuilding the three speed transmission in my 1933 Harley-Davidson VL, and I'm going to take you through the ins and outs of this unit to give you a better idea of what is going on in your own transmission. Modern transmissions are certainly more sophisticated than this vintage piece of machinery, but the overall design concepts are still roughly the same. To start, let's go through some of the major components you'll find in any transmission. First and foremost is the transmission case. Obviously, the case houses all the transmission parts, but there are a couple main variations on this piece that are noteworthy. For my VL and other Big Twin Harley's, the case is a completely separate unit which can be moved back and forth within the frame to change the tension on the chains. 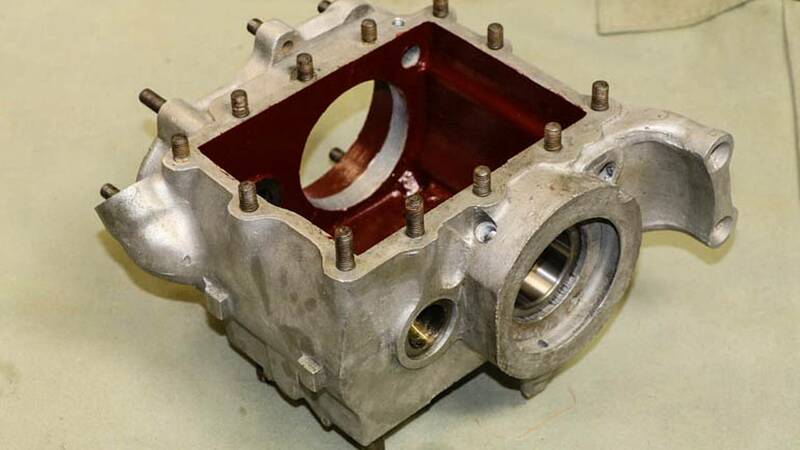 The transmission case can also be incorporated into the engine case, making the engine and transmission one unit (such as a Harley Sportster). This eliminates the need for adjustments and opens the door for other benefits like sharing fluids between the engine and transmission. Your standard transmission case, coated on the inside with Glyptal. A VL transmission uses three different sets of gears to transfer power from the engine to the rear wheel. 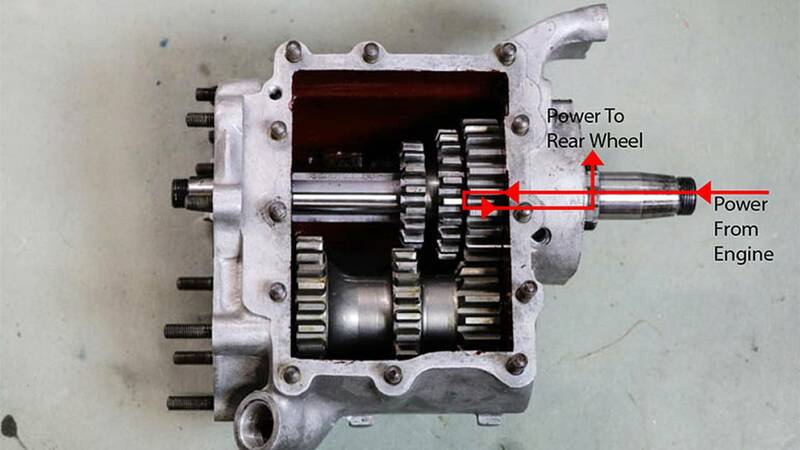 The first of these is the main drive gear which is mounted half inside and half outside of the transmission. 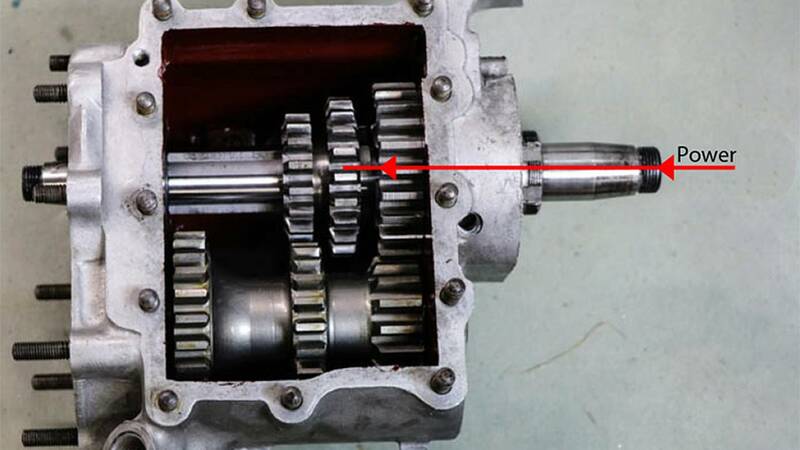 As you can see in the photo below, this gear has a threaded portion which is where the rear sprocket is mounted for the chain drive. 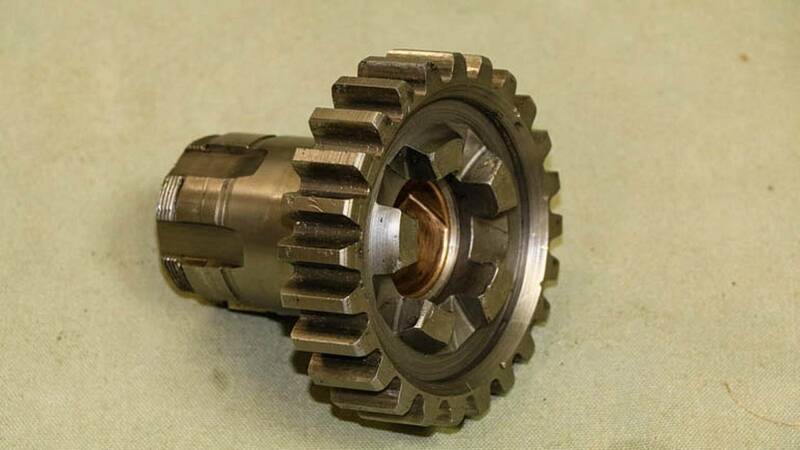 It rides on a bronze bushing which is press fit inside the gear and the bushing has small grooves added to its surface to allow transmission fluid to lubricate it as it spins on the mainshaft. Also note the protrusions on the face of the gear, their importance will be discussed shortly. The main drive gear transfers power out of the transmission and to the rear wheel. Next on our tour of gears is the cluster gear. This three gear unit is what makes the transmission a three speed – the smallest gear is first, the middle second and the largest third. This gear rides on needle bearings on one end and standard caged bearings on the other. 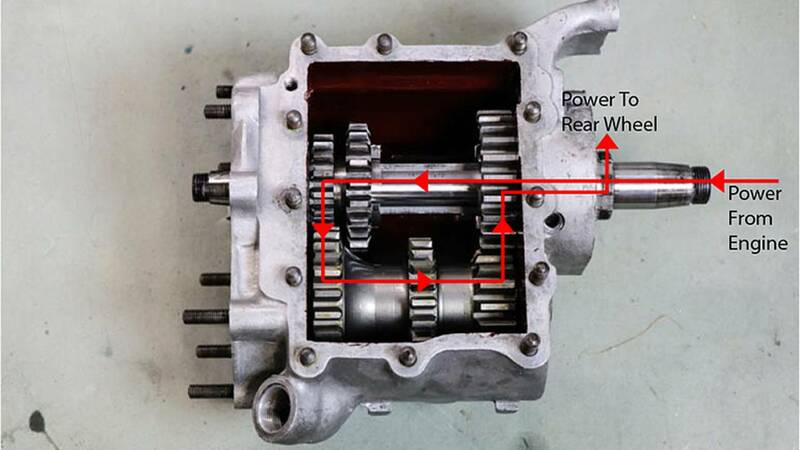 The main cluster gear contains the three gears that make this a three speed transmission. The last gear to discuss is the slider gear, which keyed to the mainshaft but slides back and forth. Using its own two gears, it engages with the second and third gear on the gear cluster. Just like the main drive gear, it also has protrusions on its face. 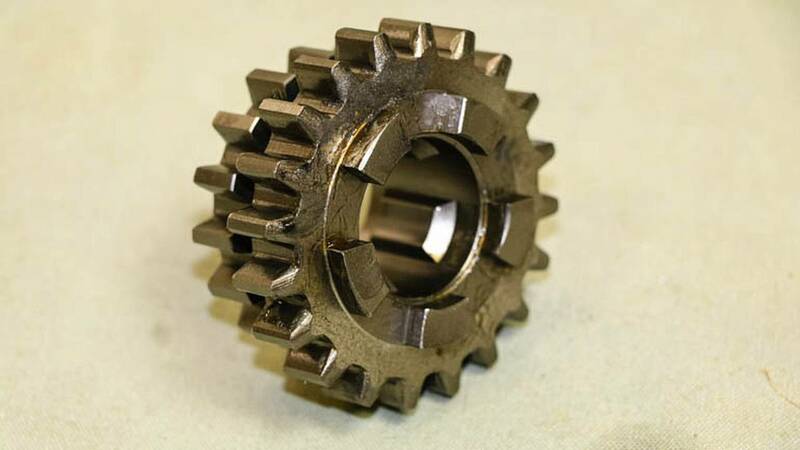 These mate with the similar protrusions on the main drive gear and are used when the transmission is in first gear. The slider gear turns with the mainshaft and can slide back and forth to mate with different gears. The next major group of components are the shafts. This transmission uses three – the mainshaft, the countershaft, and the slider shaft. The mainshaft not only holds the main drive gear and the slider gear, but also completely exits outside the transmission case to hold the clutch assembly. On the other end of the mainshaft are the components that make up the kicker assembly. The countershaft's only job is to hold the cluster gear and, unlike the mainshaft, it does not spin. The slider shaft provides a mounting point for the slider fork, the part that actually shifts the gears when you move the shift level forward or back. 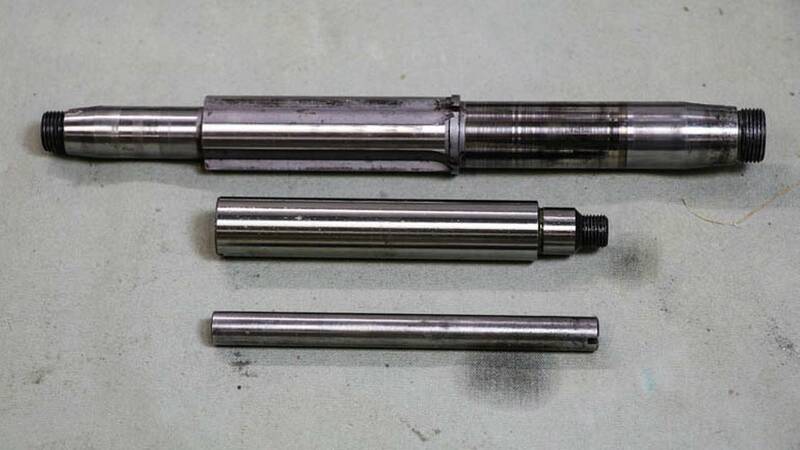 From top to bottom, a well used mainshaft, a countershaft and a slider shaft. 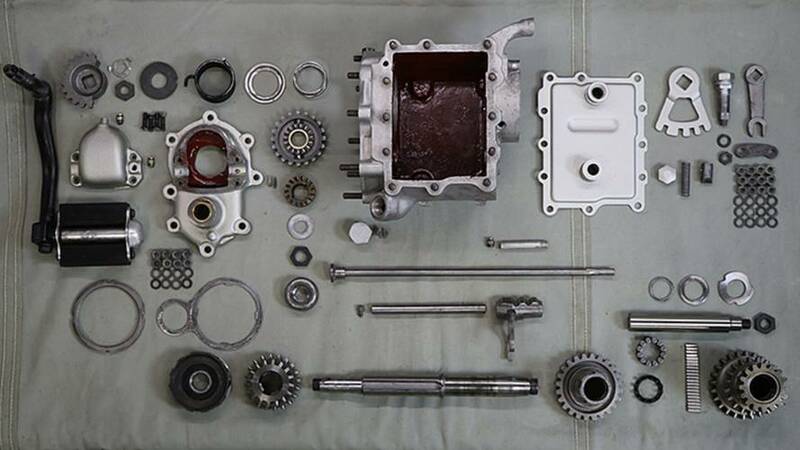 Now that you are familiar with some of the major components, lets start installing them into the transmission case to see how they work together. First to go in is the mainshaft, with the main drive gear and slider gear installed on it. Keep in mind that the mainshaft goes through the main drive gear, which means that the mainshaft can be turning while the main drive gear is sitting still. Also remember that the slider gear is keyed to the mainshaft, so anytime the mainshaft is turning the slider gear is turning. 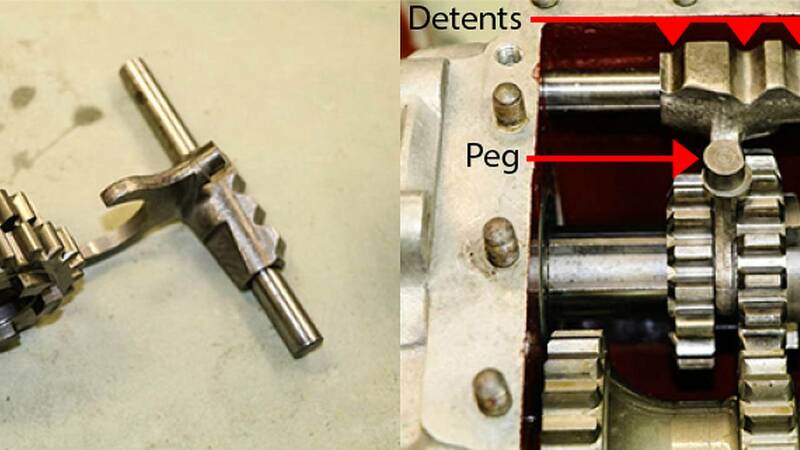 In the following picture, you can also see the teeth on the slider gear and main drive gear which allow them to be mated together. Transmission case with mainshaft, main drive gear and slider gear installed. Next I'll drop in the countershaft and cluster gear so you can really start to see how things work. In first gear, the small gear on the slider gear is mated to the large gear on the cluster gear. Power goes from the mainshaft, to the slider gear, to large gear on the cluster gear, then to the main drive gear. Transmission power transfer in first gear. 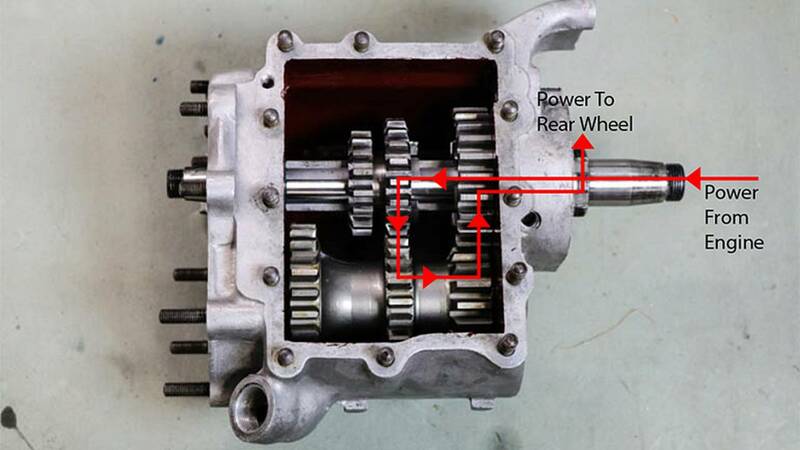 In neutral, the slider gear is positioned so that neither of its gears are engaged with the cluster gear or the main drive gear. In this position the mainshaft turns freely while the main drive gear and cluster gear are still. Transmission power transfer in neutral. In second gear, the large gear on the slider gear is mated to the middle gear on the cluster gear. Power goes from the mainshaft, to the slider gear, to the middle gear on the cluster gear, then to the main drive gear. Transmission power transfer in second gear. Here is how all these components line up when the transmission is in third gear. You can see that the slider gear is mated with the main drive gear,which locks it to the mainshaft via those cast protrusions I mentioned earlier. Power goes from the mainshaft, to the slider gear and then to the main drive gear. Transmission power transfer in third gear. The last major component to discuss is the slider fork. This bit attaches to the slider gear and then, via a number of shafts, connects to the shift lever on the side of the fuel tank. When the rider shifts gears, the slider fork pushes the slider gear along the mainshaft. Detents on the slider fork help hold the transmission in the selected gear via a spring loaded pin built into the transmission lid. The slider fork assembly, disassembled and installed in the transmission. On the bottom of the transmission lid is a piece called the gear shifting fork, which basically looks like an open end wrench. This piece clips to the peg on the shifter fork and moves the slider gear into different positions, thus shifting the transmission through its gears. The transmission lid links the transmission to the hand shifter. That is about it for this 1933 Harley-Davidson VL transmission. As you can see, while it is a very simple design it has everything you need to transfer power from the engine to the rear wheel. One thing you might have noticed about this particular transmission is that there is nothing timing the gears together. The lack of synchros is why this style of transmission is called a "crash box". There is a lot of gear grinding in these early style transmissions that has been eliminated with more modern designs. 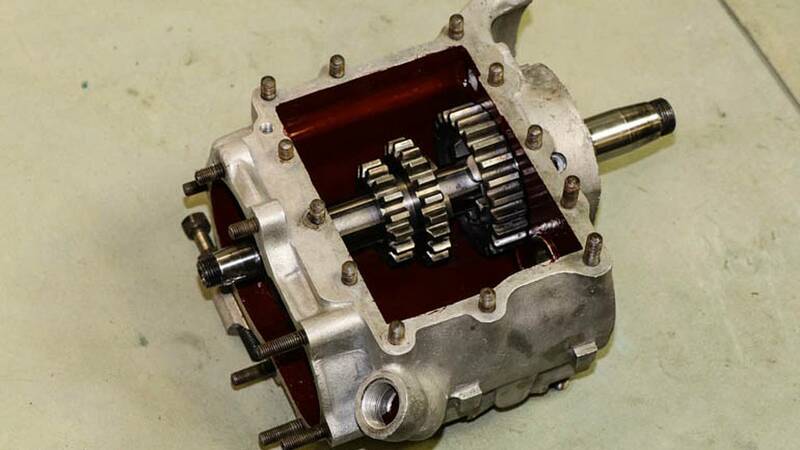 Of course there is still more to learn, like how the kickstart mechanism works and how the clutch operates, but this is a good first step in understanding what goes on inside of a motorcycle transmission.